Very useful in winter, the Finessence Organic Eucalyptus Globulus contributes to the proper functioning of the respiratory system. Antifungal and antiviral, it is used to treat conditions such as coughs and colds. Decongestant, it clears the airways and helps fight against stuffy nose. It strengthens the immune system and provides a barrier against viruses. In diffusion, it releases an intense perfume which brings freshness while purifying the atmosphere of your interior. 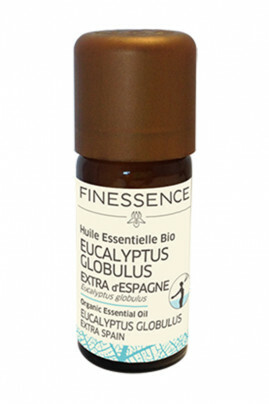 Famous in aromatherapy, The Finessence Organic Eucalyptus Globulus Essential Oil Extra of Spain is perfect for treating winter ailments. Eucalyptus globulus (eucalyptus) leaf/twig oil, linalool*, limonene*, citral*, geraniol*. Dangerous. Comply with precautions for use.Contains: linalool, citronellal, beta-pinene, alpha-pinene. May cause an allergic skin reaction. Flammable liquid and vapour. Causes skin irritation. May be fatal if swallowed and enters airways. Toxic to aquatic life with long lasting effects.